Create a sphere out of the chicken wire and then wrap the string lights around the wire. Add a wire hanger so that you can hang the ornament. You’ll of course need plenty of extension cords to make this work, but it’s totally worth it. Lights attached to the roof are nice, and icicle lights can add a nice touch. But why not make your home really eye-catching with these cascading outdoor lights? Hang them in front of your door to make a unique entrance for guests. You can also hang them from other parts of your roof to light up your walls. 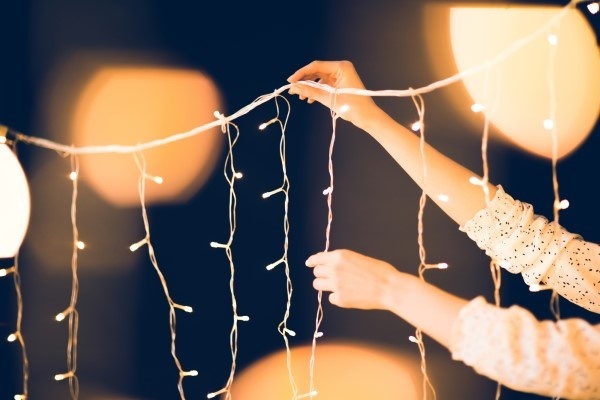 If you have an arbor or pergola, these lights make really beautiful additions to these structures and light them up well for outdoor gatherings. You can make a beautiful Christmasy entrance to your home using just a few reclaimed ladders. Three ladders painted black are all you need to create a DIY arched trellis that your guests can come through. Decorate with garlands, pinecones, ornaments, or even the cascading lights to add a unique touch of beauty to your landscape. Bushes are another great part of your existing landscaping that you can use as bases for decorations. Many people add lights to their bushes, but fake snow will really make your bushes stand out in the wintertime. Fake snow is a great option when you want that snow-dusted look, but you live in an area such as Texas that doesn’t see much snow. This snow can be paired with string lights to really draw attention to the bushes. Another option is to have lights pointed at the bushes, which will reflect beautifully off the white of the fake snow. Garlands have so much potential for adding decoration to your home’s exterior, but they’re terribly underutilized. Maybe you’ve already thought of adding them to railings or columns. But you can also drape them over windows or run them across your retaining wall and other stonework. And you’re not limited to just boring green ones; some garlands can be found in other colors; others can be found with lights, ornaments, pinecones, or flowers. There’s really no limit to what you can do with a few perfectly-placed garlands. They’re much more versatile than wreaths or solitary plants. Having plants, arbors, stonework, and other landscaping elements in your yard gives you so many more options for decorating. If you don’t have any of these and you want to get your landscaping renovated, contact Landscape By Design. They’ll create a yard for you that will awe your guests during the Christmas season, as well as at other times of the year.